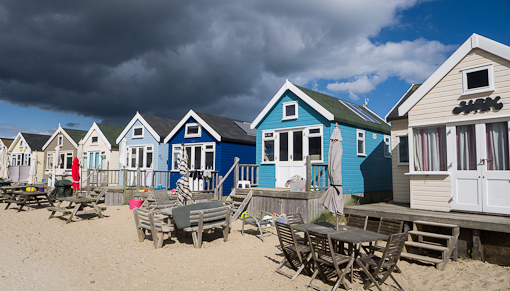 While we were staying at Bournemouth, V took us to see Hegistbury Head which is located at the Eastern end of an arc that spans a stretch of the Dorset coastline, with Bournemouth roughly in the midpoint and Sandbanks at the Western end. 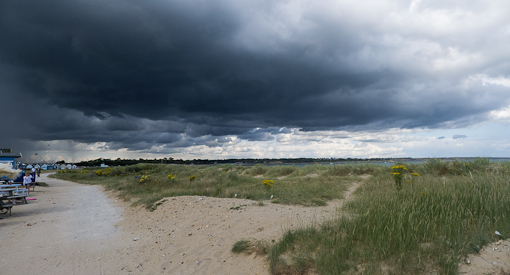 See our earlier post about Sandbanks. On our way to Hegistbury Head, we stopped along Southbourne’s Overcliff Drive to see the (mostly empty) beaches below. 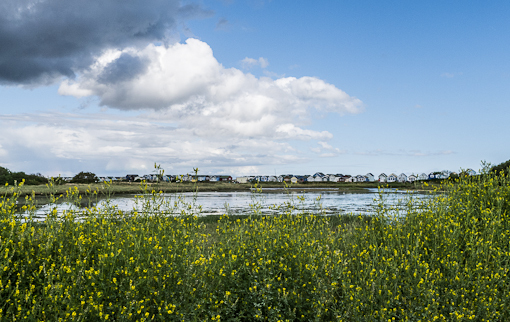 After passing rows of homes, we reached a parking lot with a cafe which marks the beginning of a nature reserve area. 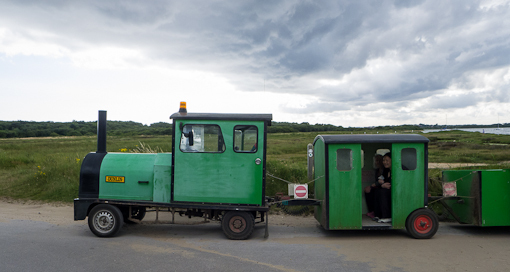 From here, we took a little train to Hegistbury Head. The train took us through a shrubby area and then across a marshland on a paved path, we could see a row of beach houses in a distance. 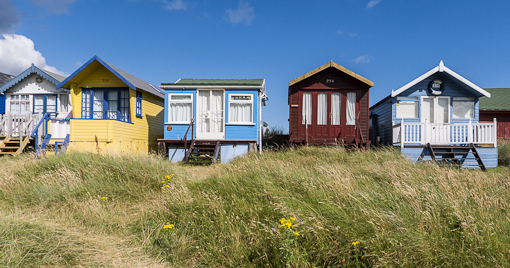 They are not houses but rather large, very colourful cabins – much bigger than those we saw at Swanage. The cliffs at the tip of the Isle of Wight from the beach. 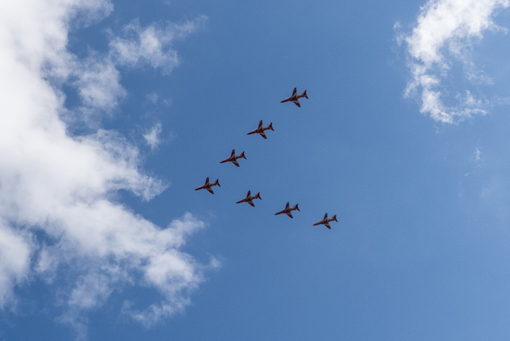 Out of the blue sky in a flash was a formation of Red Arrows jets. 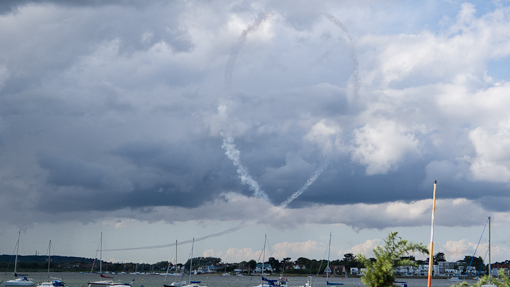 The Red Arrows is the British Royal Air Force aerobatic team (like the Blue Angels of the US navy). 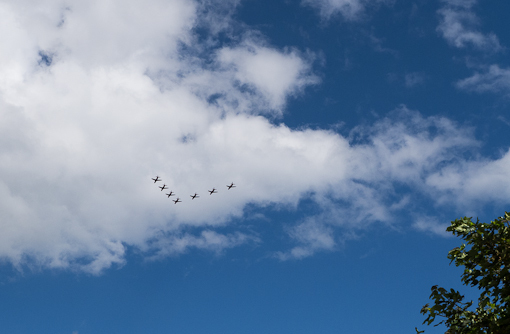 There must be an air show nearby in Christchurch. Lucky us to have seen this unexpected feat. 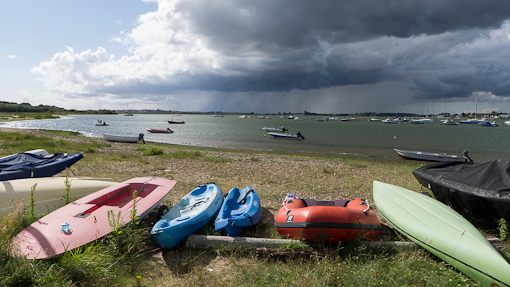 As soon as the smoke trails faded, the weather changed suddenly with dark clouds rolling in from the north east direction across Christchurch Harbour. 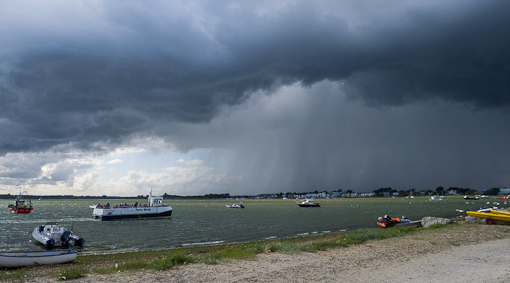 The ferry was rushing back to Mudeford on the other side of the harbour. On the Channel side, it was just as spectacular. Luckily, we were not caught by the rain and managed to get back on the train to the parking lot. 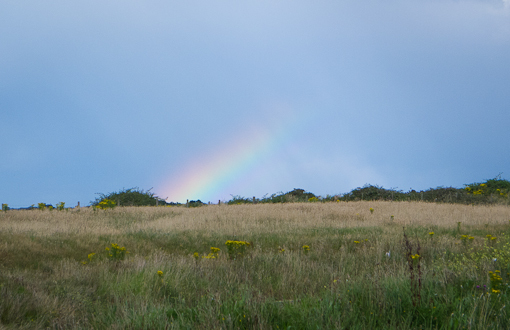 We even managed to see a rainbow! 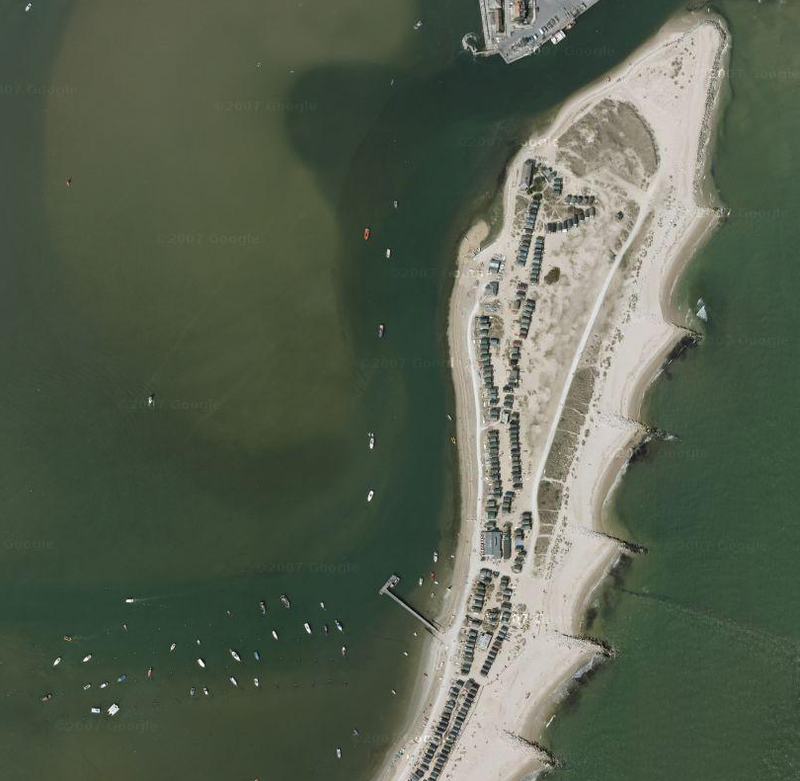 This is a Google map overhead view of Hegistbury Head with the harbour on the left and the Channel on the right. 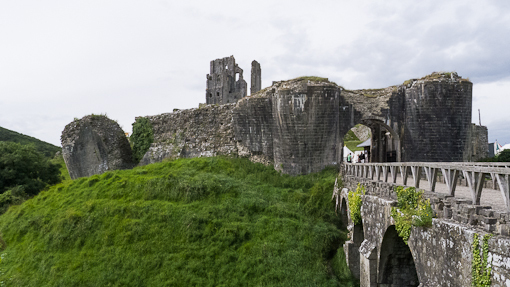 Corfe Castle is on a hill overlooking the village which bears its name in Dorset, England. We and V got here by steam train from Swanage (see earlier post). 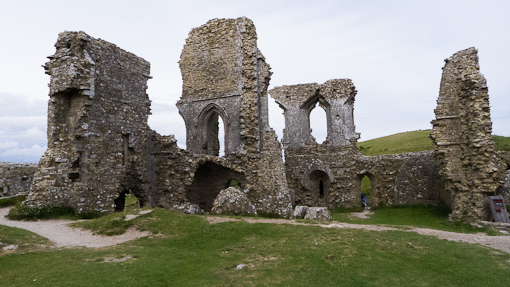 The castle was built by William the Conqueror in the 11th century and commands a high point in the Purbeck Hills overlooking the area from Wareham to Swanage. 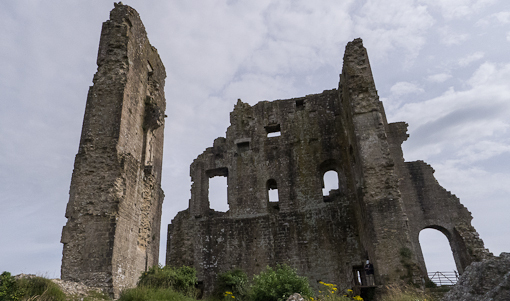 Apparently, it was one of the earliest castles in England to be built using stone. The castle was bought by John Bankes, Attorney General to Charles I in 1635. Bankes was a Royalist and the castle was besieged for many months during the English Civil War. In the end, the Parliamentarians entered the castle and ordered it demolished, which resulted in the castle’s current form. The stones were taken by locals to build their homes in the village. The castle was bequeathed by the Bankes family in the 1980’s to the National Trust which declared it a “nationally important” historic building and archaeological site. 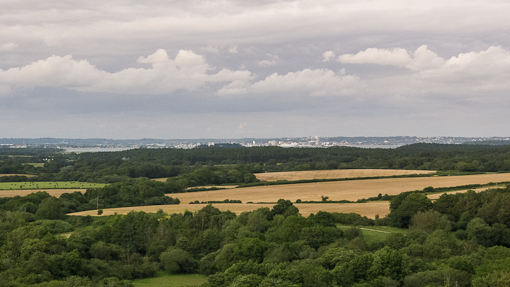 From the castle which sits on top of a hill, looking north, Poole and its harbor are clearly visible. 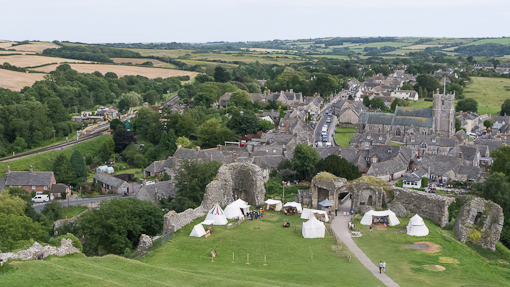 Looking south, one can see the village of Corfe Castle and farms beyond which is the coastline. The white tents visible near the entrance were set up for a temporary exhibition about medieval life. 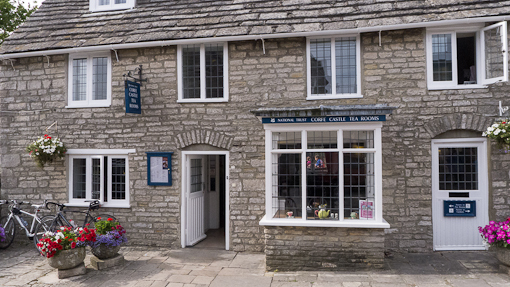 After visiting the castle, we wanted to have cream tea but were too late for the National Trust tea room. So we settled for the Bankes Arms and it was disappointing. The scones were ok but the clotted cream was just not what we expected as it came out in plastic cups and tasted heavy and blend. 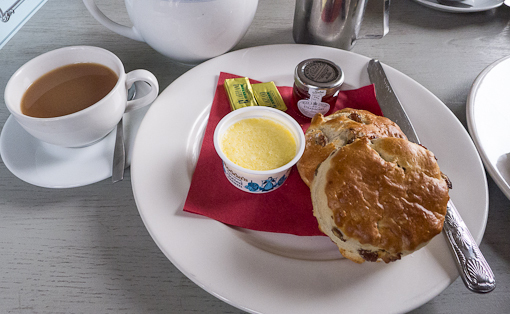 Well, I (Chris) lived several years in Devon and had some very nice memories of Devonshire cream tea. Perhaps, because we were in Dorset ?! At the end of the day, we took the other Purbeck Breezer route no. 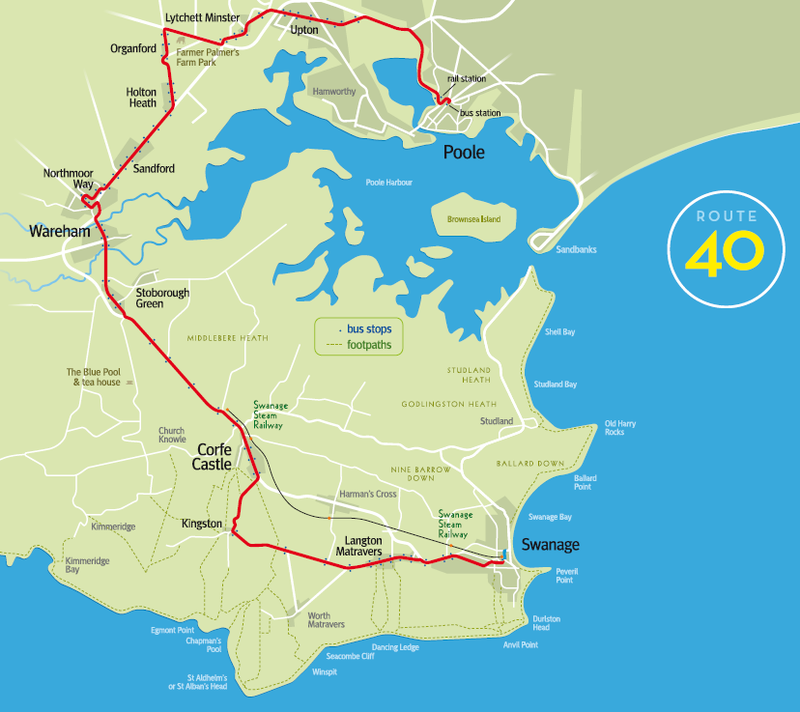 40 from Corfe Castle back to Poole. So we circled Poole Harbour once in the clockwise direction. See earlier post about the no. 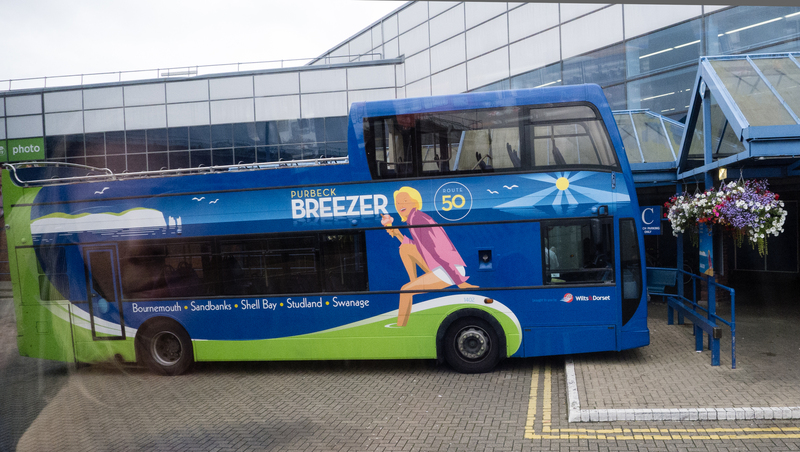 50 Purbeck Breezer which we took from Westbourne, crossed the entrance to Poole Harbour near Sandbanks, and reached Swanage. We really had a great time with V touring the sights of Dorset by public transportation. 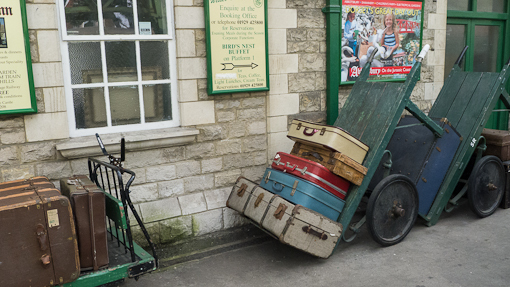 After a fish’n’chips lunch by the Swanage waterfront (see earlier post), we and V stumbled into this train station while strolling in town. There was a train on the platform for Corfe Castle. We bought tickets hurriedly as the train was very much ready to depart (judging by the puffs of steam pouring out of the locomotive). We did not even know the timetable. 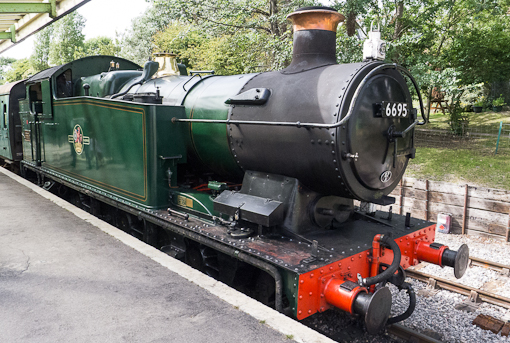 According to Wikipedia, the Swanage Railway was opened in 1885. After more than 70 years of service, it was due for closure in the 60’s as the British railway infrastructure was being electrified. 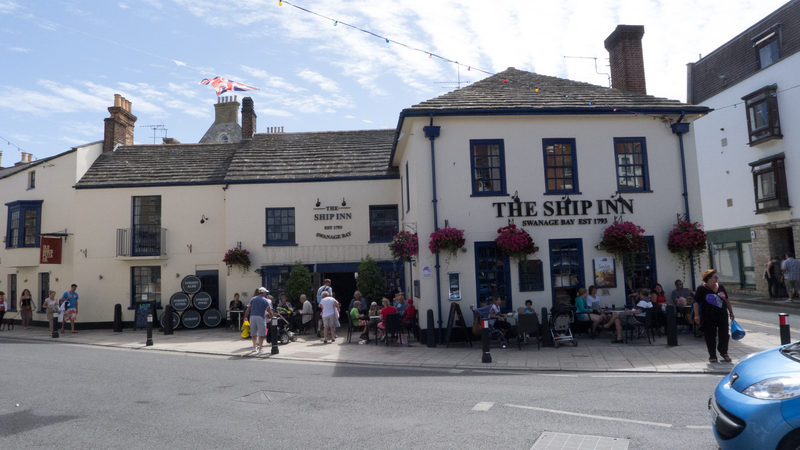 British Rail was proposing a bus service to connect Wareham and Swanage but it was deemed inadequate to handle the traffic in the summer months. 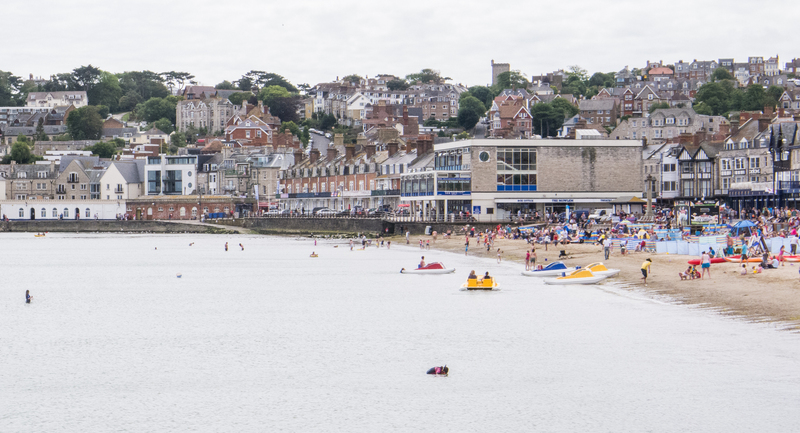 Remember, Swanage is a beach town. The line was closed in January 1972. But 4 months later, the Swanage Railway Society was formed with the objective of restoring an all-the-year-round community railway service linking to the main line at Wareham and which would be ‘subsidised’ by the operation of steam-hauled heritage trains during the holidays. 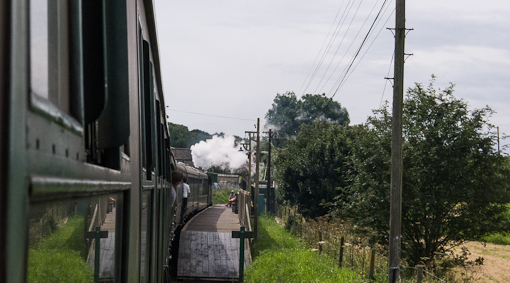 The Swanage Railway was about 6 miles in total linking Swanage to Nordon via Corfe Castle and Wareham. It reopened in 1995. 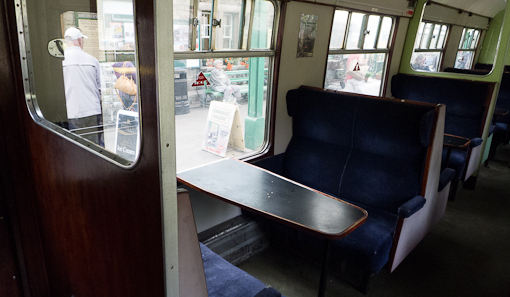 I (Chris) vaguely remember the upholstered seats in this type of carriages – the doors cannot be opened easily from the inside – most people lean out and turn the door handle on the outside. As I leaned out the window, some unknown fine particles were hitting my face. It did not look black so I was not sure if it was soot. Later during the day, we saw another steam locomotive. 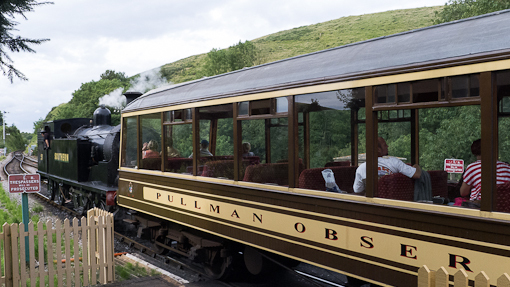 It was pulling a Pullman first class carriage with big windows. The Pullman luxury train concept was pioneered by George Pullman, an American that developed the sleeping car. 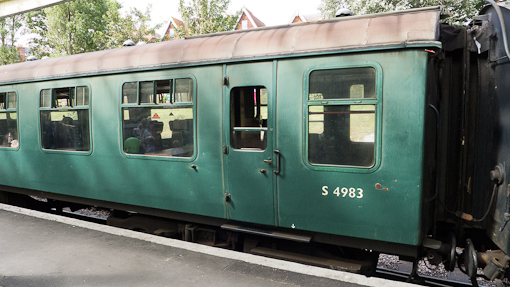 The Pullman mainline rail service that ran in these parts of the UK ended in the late 60’s, so these carriages are more than 50 years old. 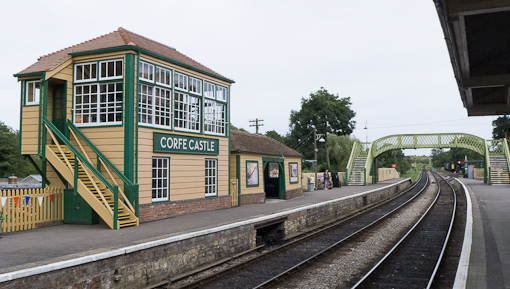 Corfe Castle signal box(?) at the railway station. 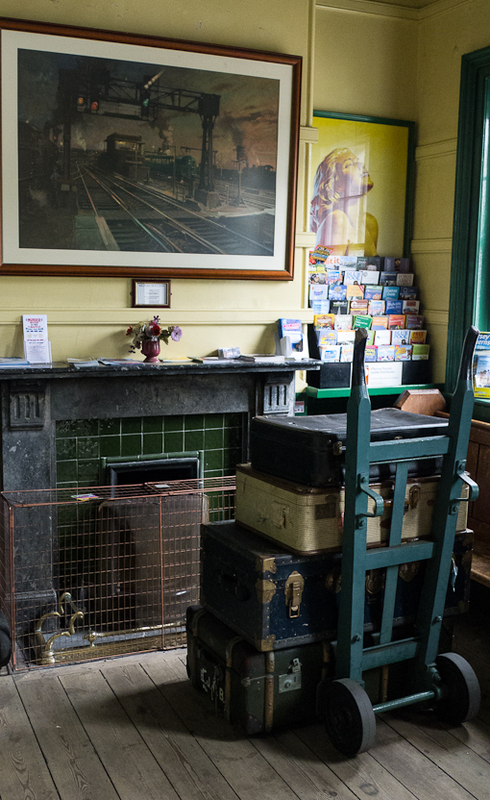 Waiting room at the Corfe Castle railway station. 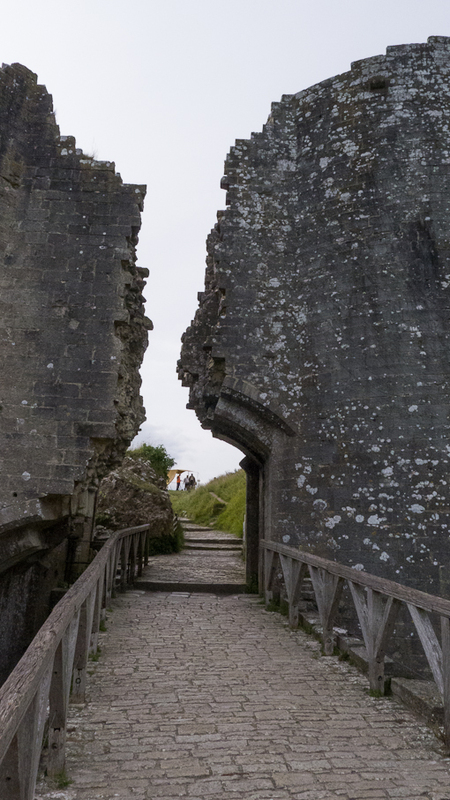 More about Corfe Castle in our next post. Before going to London for the Olympic Games, we stopped by Bournemoth in the south of England to visit V.
The Purbeck Breezer is a bus service that runs from Bournemouth to Swanage, a seaside town on the southern coast. 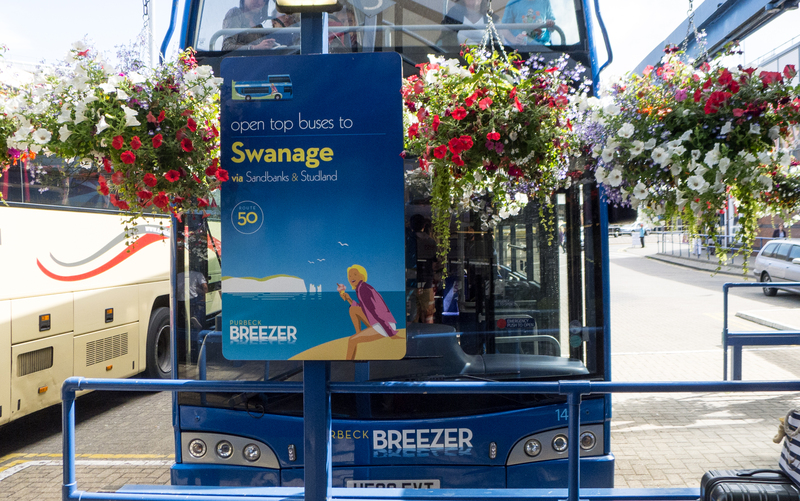 The Breezer is operated with a fleet of double decker buses some of which have an open top. We first saw the Breezer (No. 50) when we arrived at Bournemouth’s main bus station by National Express after we landed at Heathrow airport. We and V, the three of us caught the bus at Westbourne and sat on the top deck. The bus winded its way through the leafy suburbs of Bournemouth (the top deck hitting and snapping a few tree branches along the way) to Sandbanks. 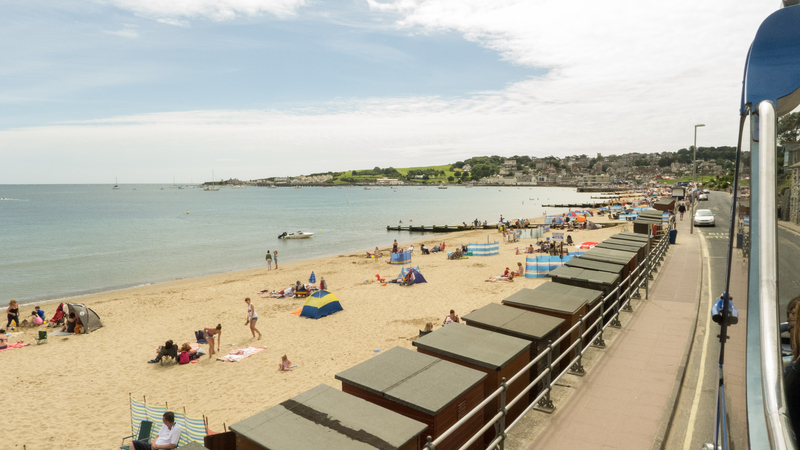 According to Wikipedia, Sandbanks has the highest concentration of expensive real properties in the UK outside London and the beaches there are the best in the UK. Geographically, Sandbanks is a small peninsula of 0.4 sq miles that lies at the mouth of Poole Harbour on the English Channel coast at Poole in Dorset. 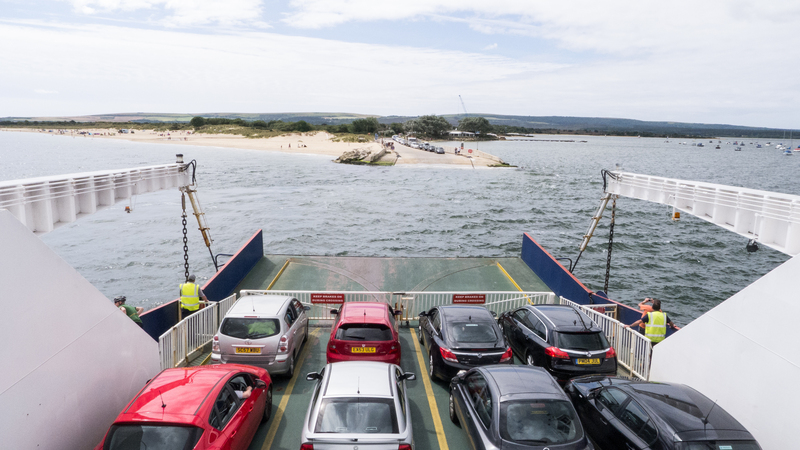 Sandbanks is connected to Studland by a chain ferry, the Sandbanks Ferry, which runs across the mouth of the harbour. 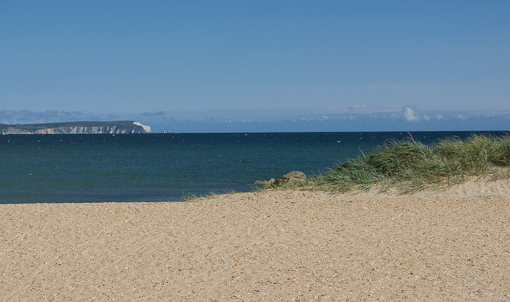 It avoids a 25 mile loop around Poole harbour to reach Studland. 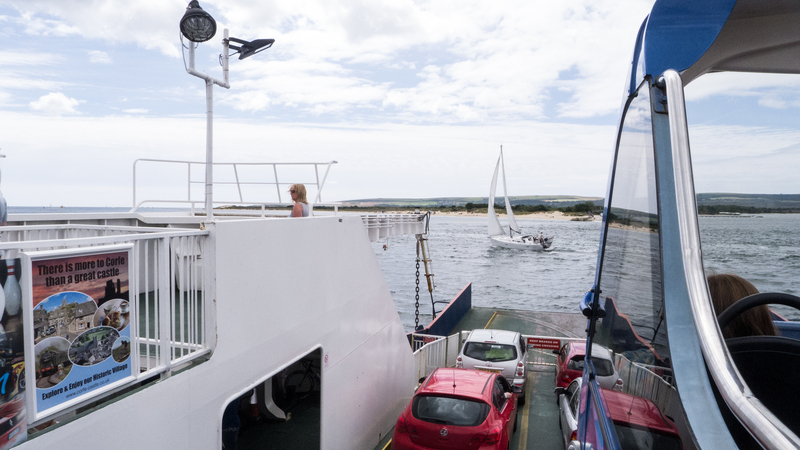 The channel used by leisure boats and ferries to France is generally very busy. It was fun to cross the channel sitting on top of an open-top double decker bus while sailboats cut across swiftly. A sandy beach and nature reserve awaited on the other side. Studland heath behind the beaches and the cliffs. 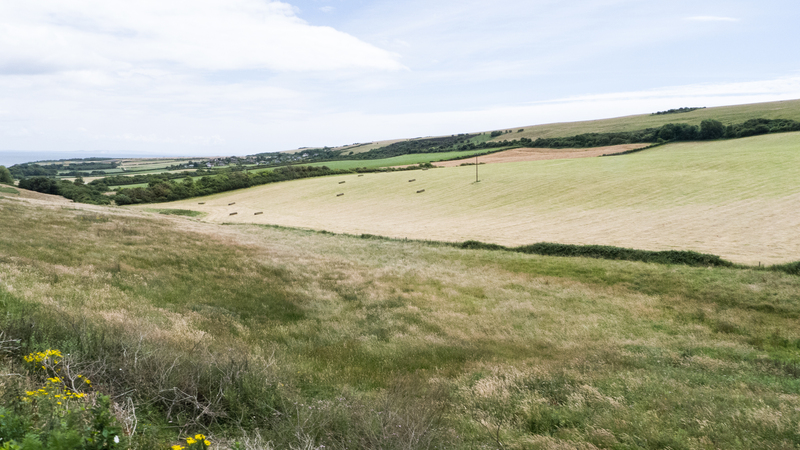 This was the best part of the ride – the bus was going quite fast as there was little traffic, it was breezy, and being high up on the bus, we could see the open fields beyond the fence or hedge. 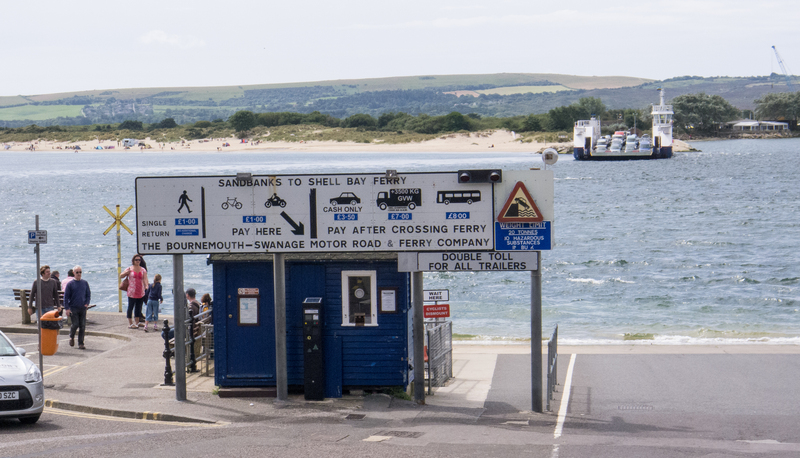 Including the wait for the Sandbanks Ferry, we reached Swanage after about 30 minutes. 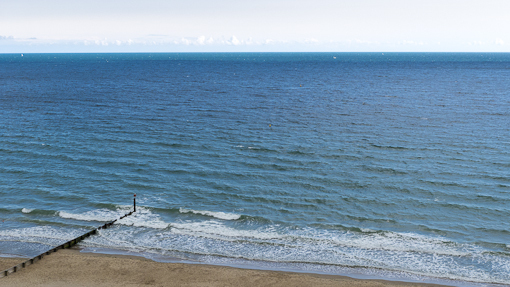 Swanage is a seaside resort with a sandy beach and a large number of hotels. In the past, it was a fishing village and then a quarrying port – marble from the area were used to build many churches in London in the 1700’s. It was a summer day with some clouds which were welcomed as we did not want to be fried. We did not go into the water but noticed that it was low tide. 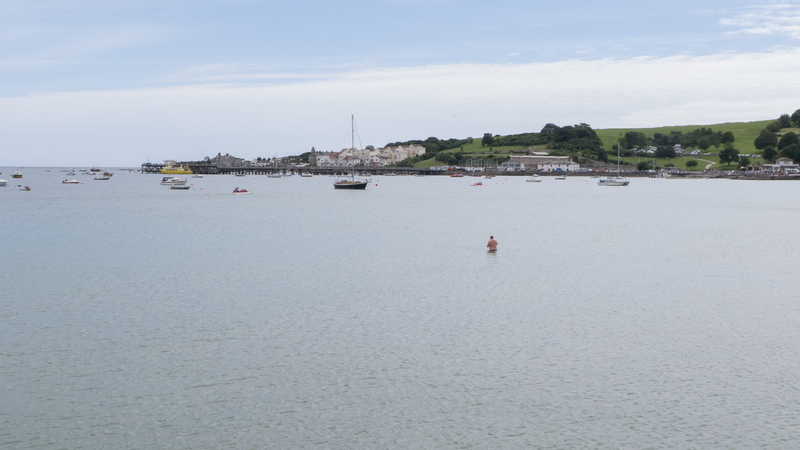 This man was standing in shallow water although he was quite far from the beach. The main part of town is just behind the beach. Looking back across the beach towards the edge of the town. 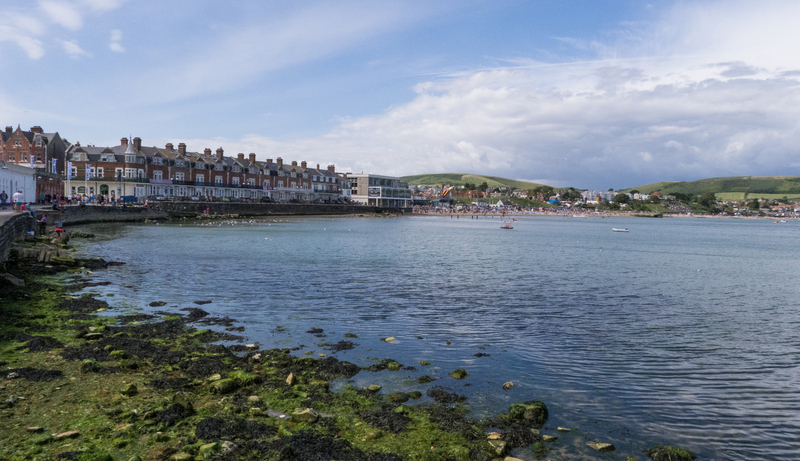 Swanage is the easternmost entry point to the Jurassic Coast World Heritage Site which consists of cliffs and landforms documenting millions of years of geological history. I would love to do some hiking in this site on the Southwest coast path. 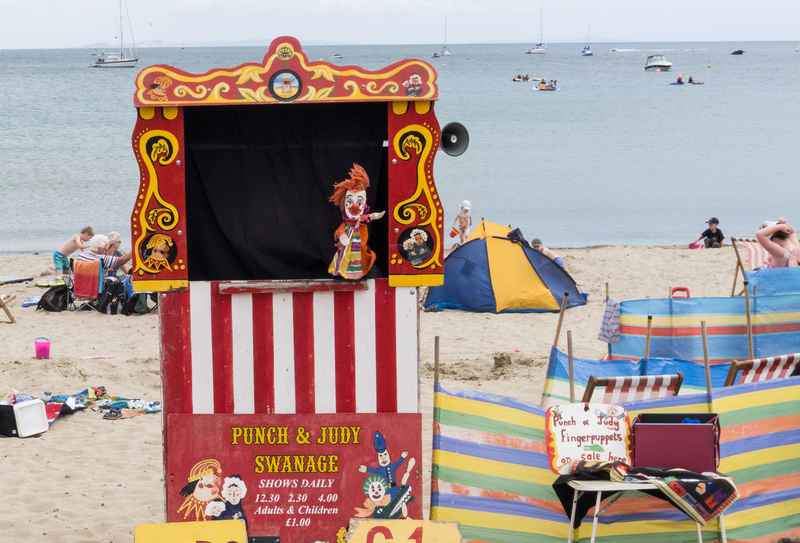 We strolled along the beach and came across a traditional British seaside attraction – Punch and Judy – a puppet show for kids. 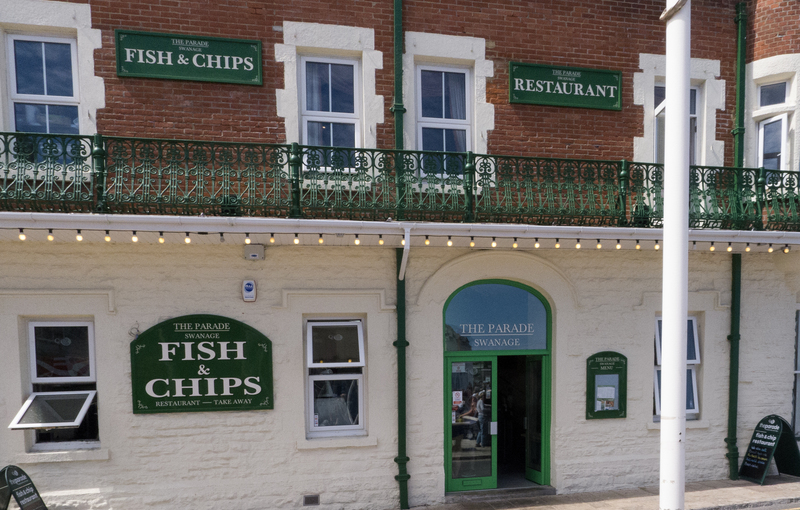 It was lunch time when we arrived – so we went around looking for a Fish and Chip shop – and luckily found a table on the second floor of The Parade. 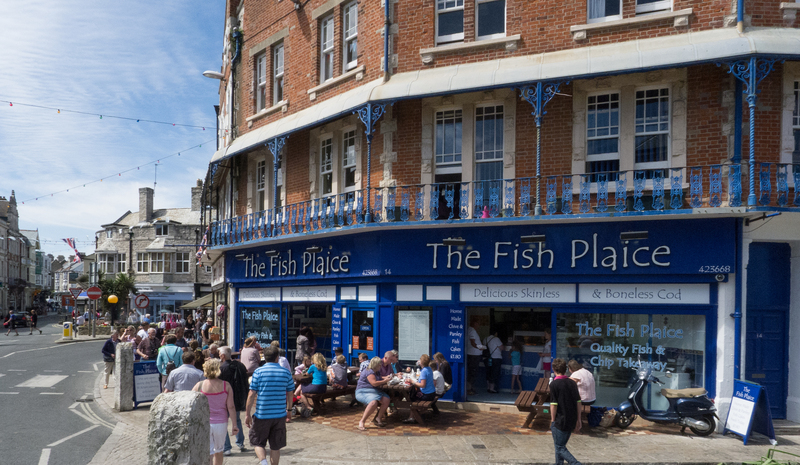 The Fish Plaice was located just around the corner but it was so crowded that we did not even bother to try. After lunch we strolled through the small town center, and checked out some souvenir shops. By chance, we came across a restored train station for steam trains which run between Swanage and Wareham. 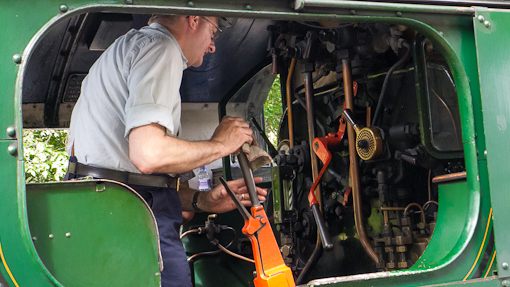 We will do a post on our antique train ride through the Isle of Purbeck – as this area is known in Dorset. 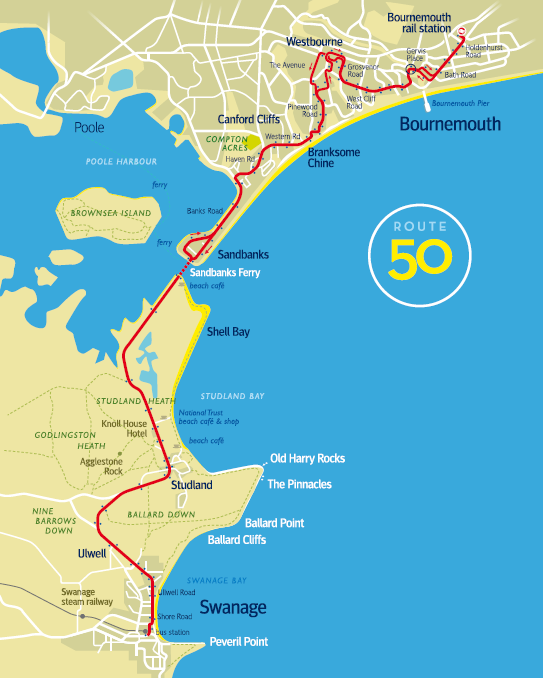 We highly recommend any one staying in Bournemouth to visit Swanage via the Purbeck Breezer (route details are here).